The execution of professional wrestling moves such as pile drivers, crossbody checks, backhand chop, short-arm clothesline, corkscrew elbow drop, elbow smashes and others done by these stars, like Ric Flair, Dusty Rhodes and Jerry “the King” Lawler, go as far back as the 1940s and with a few mix glitches, disagreement, splits and joining, the Memphis wrestling was able to evolve to the grand show that it is remembered as today. It all began at the Continental Wrestling Association which was a wrestling promotion, usually referred to as Mid-Southern Wrestling or the Memphis territory and was founded by Jerry Jarrett. Before then, local TV wrestling in Memphis was traced back to 1949 when it was aired on the original host station called WMC-TV while the live events held at the Memphis Ellis Auditorium. During the latter half of the 1960s and into the 1970s, Jerry Lawler and Jerry Jarrett became very important in influencing the business in Memphis and throughout the territory for decades. The first of the two was Jerry Lawler, which was initially portrayed as an all-around nice guy who could not win a match no matter what he did. The second was Jerry Jarrett, who actually made a splash teaming with Jackie Fargo and Tojo Yamamoto, and whose influence behind the scenes in the promotion would grow over time. As Memphis show began to go viral, it was common for other cities in the by-then Nick Gulas-Roy Welch-controlled territory to be sent to the Memphis TV show to watch via tape instead of their show from time-to-time. This was usually done to get over some angle that had already occurred on the Memphis TV show. Out of all the cities in that territory, Memphis started to grow in significance as well. Although, the Gulas promotion was based in Nashville city, it was in operation for a long time out of the Sam Davis Hotel, Memphis was the big money town in the circuit. By 1972, Memphis had the best chance of filling their home arena on a weekly basis as opposed to other cities in the circuit. As a result of the split, on February 14, 1977, Jerry Jarrett established Continental Wrestling Association and Jerry Lawler, who had become the area’s top star at that time, became the first person to sign up. Knowing that a TV show was important to the success of his promotion, Jarrett talked with WHBQ-TV officials about the time slot on the station expecting to wrest it away from Gulas. WHBQ-TV officials though made a shocking decision. Despite good and excellent ratings, WHBQ-TV canceled the wrestling show effective March 12 because officials were worried about a possible lawsuit the two groups might engage the station in over who held the rights to the time slot. Jarrett decided to move on to a potential new TV show to WMC-TV, the original home of Memphis studio wrestling. WMC-TV, aware of the excellent ratings and revenue the TV wrestling show had generated and could also generate, especially with Jerry Lawler as the top star, jumped at the chance to host the show. As the 1980s progressed, few elements of the show changed. One thing that appended a new dimension to the show was to make use of videos set to popular music highlighting a certain wrestler, tag team or feud. Starting with the Handsome Jimmy Valiant video “Son of a Gypsy” the promotion started successfully, and often, joining the video music field into wrestling. Jerry Lawler would diddle in music during the late 1970s and hook up with Jimmy Hart to record “Bad News.” Over time, dozens of videos were made about Jerry Lawler. Others highlighted Bill Dundee, Jimmy Hart, and The Fabulous Ones: Steve Keirn & Stan Lane. Various videos highlighting Keirn & Lane helped and assisted in getting them over with a vocal female fan base and helped open other promoter’s eyes to the lucrative young female fan base. Even those who did not quite reach the top of area cards such as Big John Harris, Tommy Wright, and others were recipients of music videos in an attempt to get them over with fans. A significant event happened in the early 1980s, a supposed feud between Andy Kaufman, an American entertainer, writer, actor, performance artist and professional wrestler and Jerry Lawler. Andy Kaufman offered women $1000 if they could beat him, wrestled them and proclaimed himself the “Intergender Wrestling Champion.” As part of this performance, Kaufman would suggest that these matches were “real” and thus also indicated that professional wrestling was not “real,” which countered the sacrosanct belief of fans in that era that wrestling was “real.” This infuriated Jerry Lawler who was a proud defender of wrestling thus came the inevitable Lawler/Kaufman match where Lawler executed two Piledrivers (a move that was actually “banned” in Memphis) after which Kaufman was carried out of the arena on a stretcher (kayfabe). 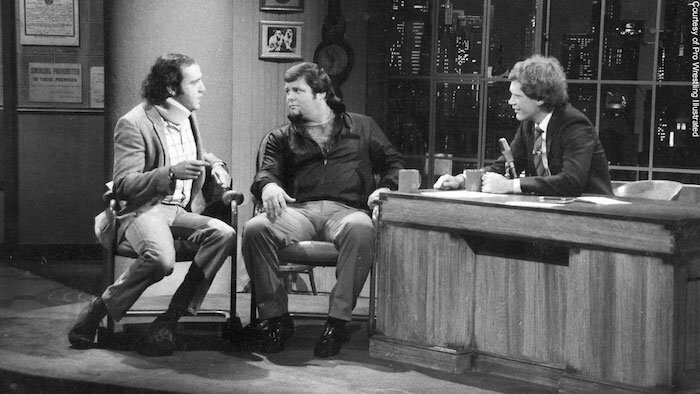 On another episode, on July 27, 1982, Kaufman and Lawler were guests of David Letterman on Late Night with David Letterman. Kaufman still wore the neck collar. After Kaufman had unleashed a profanity-laced tirade on Lawler, culminating with Kaufmann tossing a cup of coffee at him, Lawler stood up and then struck and spanked the comedian out of his chair and off the stage. Kaufmann then continued to curse Lawler as he (Kaufmann) stormed out of the studio. Meanwhile, the fans loved every second of the dramatic episodes between these two which was later revealed to have been fake as the two were friends. By 1988 going forward the Memphis studio show, Championship Wrestling, had become an area tradition. Also, it had become a mostly well-loved TV show by longtime wrestling fans. Weekly, fans tuned in to watch plenty of mayhem and madness and they usually left satisfied.